Summon and Last Gasp: Draw a card and reduce its cost by 2. Eclipse Baroness is an epic Agility creature card. It is part of the Dark Brotherhood story set. A playset of the card is awarded for completing Eclipse Hideout. The premium version can only be obtained by soul-summoning, which is only possible after the completion of Eclipse Hideout. "Let's go then. My time is precious." 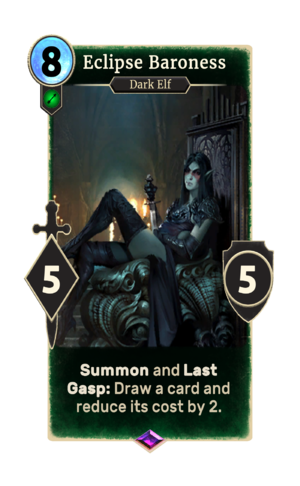 The card's summon ability applies the Baroness' Favor card effect. The card's last gasp ability applies the Baroness' Heirloom card effect. This page was last modified on 27 February 2019, at 21:32.